The official NCAA March Madness social accounts produced a 94% increase in engagements vs. last year’s Tournament (Facebook, Twitter and Instagram). Videos across the three platforms generated over 135 million views, up 74%. Facebook has secured a last-minute deal to broadcast this year’s edition of the Masters in the Middle East. The countries covered in the deal are the United Arab Emirates (UAE), Qatar, Saudi Arabia and Israel. Topgolf, the fast-growing high-tech sports entertainment company, plans to debut a new concept for dense areas in the Seattle suburb of Kirkland later this year. The 7,761-square-foot location will feature four public hitting bays and a private, VIP bay for events and “celebrity guests who are expected to frequent the Topgolf Lounge,” according to a press release on the new concept. Topgolf says it has 53 venues across the U.S., serving more than 17 million guests annually. The National Basketball Association has agreed a streaming deal with YouTube to simulcast live broadcasts from its NBA 2K League gaming series on the social video platform. Highlights throughout the esports series’ second season will also be distributed via the official NBA 2K League YouTube channel, which was launched ahead of its inaugural campaign in 2018. A 10-year partnership between the Seattle Storm and Symetra Life Insurance Company. The deal, which is the largest deal in the Strom’s history, will include everything from Symetra getting a patch on the Storm’s jersey to being the presenting partner of the team’s season this year, their 20th in franchise history. Can Kobe Bryant bring his “Mamba Mentality” and successfully lead the front office of the Los Angeles Lakers? Bryant is listed as one of the current favorites to succeed Magic Johnson as the Lakers president of operations. 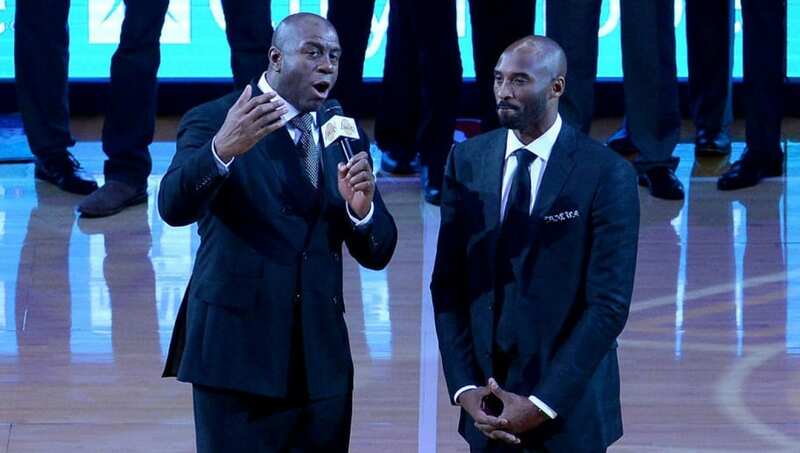 The future is uncertain in Los Angeles after the ​resignation of president of basketball operations Magic Johnson on Tuesday night. The team may be looking to make a big offseason splash to reunite of a pair of former teammates. Boston Celtics star point guard Kyrie Irving will reportedly meet with the Lakers during free agency. ​It’s been speculated for the entire season, and even part of last year, but now it’s ​official. Dirk Nowitzki has announced his retirement from the ​NBA. After 21 seasons with the ​Dallas Mavericks, the German superstar is calling it a career. The 40-year-old revealed his plans to retire on Tuesday after the Mavs’ final home game of the season. Marcus Smart has suffered a torn oblique on left side and could be sidelined for the first two rounds of the playoffs. Smart was having a career year. He has been the NBA’s best defensive guard and developed into a capable 3-pointer. His energy is irreplaceable. This is a big loss. Discussions between the NBA and the players’ association to end the one-and-done era and lower the league’s minimum age to 18 have resumed in recent weeks, infused with urgency as the clock ticks on the league’s preferred target date of the 2022 NBA draft. Jarrod Dyson comes in as a pinch-hitter and smashes a walk-off two-run home run to right field, giving the Arizona D-backs a 5-4 comeback win. Two Major League teams have scored six or more runs in 11 of their first 13 games in a season since 1908. The 1932 New York Yankees and the 2019 Seattle Mariners. The ​Chicago White Sox likely regret trading away Fernando Tatis Jr. a few seasons back, and now they’re giving it another go with his brother, 17-year-old ​Elijah Tatis. The son of former 11-year MLB infielder Fernando Tatis Sr. and the brother of the ​San Diego Padres rookie shortstop, the youngest member of the family will sign with Chicago for $500,000. The St. Louis Cardinals are locking up veteran Matt Carpenter, who in 2018 had a big season. Carpenter posted .257/.374/.523 with a career-high 36 home runs and 81 RBI. The team announced the deal would be for two years, with the potential to reach three if certain thresholds were met. The Chicago Cubs have extended utility man David Bote and starter Kyle Hendricks, who earned four years and $55.5 million. But the Cubs still have work to do to get the majority of their young stars locked up for the foreseeable future, which are Anthony Rizzo, Javier Baez, Kris Bryant. Bryant and Bryce Harper are childhood pals. It also doesn’t hurt that they share the same star agent in Scott Boras. Luis Severino’s recent MRI revealed a Grade 2 lat strain that will cause the righty to be shut down from throwing for the next six weeks. With Severino and CC Sabathia on the shelf, the Yankees have been leaning on James Paxton, Masahiro Tanaka and J.A. Happ as the top three options in the starting rotation. Dallas Keuchel, could be the newest New York Yankees. Keuchel’s asking price has reportedly begun to come down recently. The Yankees would pay a 32 percent tax on any dollars spent on Keuchel and would forfeit their second-highest draft pick and $500K of international bonus money by signing the 2015 AL Cy Young winner. Vladimir Guerrero Jr. is heading to Triple-A Buffalo, the 20-year-old phenom, who is MLB Pipeline’s No. 1 overall prospect. Triple-A Buffalo is expected to be Guerrero’s final stop before he makes his Major League debut. Blue Jays president Mark Shapiro said in late March that Guerrero would be on an “accelerated” path to the Majors once he returned to health. The Oakland Athletics and pitcher Edwin Jackson are nearing an agreement on a minor league contract. Jackson, 35 made 17 starts for the A’s last year and had good results. He compiled a 3.33 ERA with 68 strikeouts and 37 walks across 92 innings. Jackson will provide rotation depth once again for the A’s. The Los Angeles Dodgers announced Russell Martin has been placed on the 10-day injured list with lower back inflammation. He’ll be replaced on the active roster by fellow receiver Rocky Gale. The San Francisco Giants selected catcher ​Joey Bart with the ​No. 2 overall pick out of Georgia Tech in last year’s draft, and this kid is currently showcasing his skills on both sides of the plate. A day after hitting his first home run of the season, Bart flashed the leather and did something behind the dish you don’t see too often. Bart not only threw out two runners who were trying to steal a bag off him, but he also picked off two runners. Just a disastrous day for the baserunners. ​The ​New York Giants have just locked down a key member of their offense for the foreseeable future. Sterling Shepard has reached an agreement on a four-year contract extension worth $41 million. The ​New England Patriots are still in need of some help at wide receiver. former Denver Broncos and Houston Texans wide receiver Demaryius Thomas for a free agent visit. Also, former Jaguars RB T.J. Yeldon is scheduled for a visit on the same day. ​Bill Belichick was asked in a recent press conference about Greg Schiano’s​ unexpected departure as the​ team’s new defensive coordinator at the annual pre-draft press conference this week, he gave the press his normal response: deflect, deflect, deflect. Authorities in Kansas City cited a man, 64–year-old Dwyan Morgan who has been accused of flashing a laser at New England Patriots quarterback Tom Brady during their AFC championship game in January. The offense is punishable by up to a year in jail or a fine up to $1,000. The Masters is played at Augusta National Golf Club in Augusta, Ga. Augusta is about 150 miles east of Atlanta near the South Carolina border. The tournament has been played in the city since 1934, one year after the famous course opened for play. Matt Wallace wins Masters Par 3 contest in playoff. Brooks Koepka revealed on Tuesday at Augusta National that he underwent tests following The Players Championship. Koepka explained that his energy issues were the result of a diet that limited him to 1,800 calories a day, but he added that his health has improved in recent weeks and that he doesn’t expect any lingering issues. Francesco Molinari has come a long way, in 2006 Molinari came to the Masters to caddie for big brother Edoardo, who was the reigning U.S. Amateur champion. 13 years later and Francesco is not only playing in his eighth Masters, he comes here having already won The Open last summer at Carnoustie, ranked seventh in the world and as one of the top 10 betting favorites to win the green jacket. Nevada is expected to hire former UCLA head coach Steve Alford for its coaching vacancy. Alford was fired by UCLA on Dec. 31, 2018. He reached the NCAA tournament four times in six seasons with the Bruins, including a trio of Sweet 16 appearances. Alford coached at New Mexico, Iowa and Missouri State before heading to Westwood in 2013. After a successful stint at the University of Nevada, Eric Musselman has made the move as the new head coach of the Arkansas Razorbacks. Musselman led the Wolf Pack into national prominence with three NCAA tournament appearances and a Sweet 16 last season. Aaron McKie, a Philly native and Temple alum that has spent five years as a member of Temple’s staff. He now will abe the head coach for the Owls. Marvin Menzies three-year tenure as the head coach at UNLV is over. The Rebels hired South Dakota State head coach T.J. Otzelberger. As the head coach of the Jackrabbits, Otzelberger led the program to multiple NCAA tournament appearances while coaching one of the nation’s best players in Mike Daum.